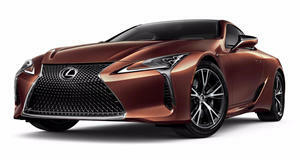 We were thrilled when Lexus launched its LC grand tourer in mid-2017 as an early 2018 model for two reasons: its stunning styling and naturally aspirated 5.0-liter V8. Sure, there’s a V6 hybrid variant as well, but it’s the V8 you want. Pricing for a new LC starts off at around $94,000 and, with added features, will easily climb well above $100,000. But according to Autotrader, LC prices are quickly losing value. Right now, the least expensive used Lexus LC up for sale on Autotrader is listed at $70,570. Chances are, prices for used examples will dip below the $70k mark once the 2020 models start arriving. Earlier, second-hand LCs had already dropped to around $80,000 – often times $40k off the original price. Right now, the typical price for a used LC hovers between $75k and $80k, even for V8 examples. So what’s going on here? Why are depreciation levels so high? The likely answer is because the LC is a niche model. It’s not for everyone. It’s also expensive, even with the price drops. Not everyone has $70k to $75k available to spend on a big rear-wheel-drive coupe. The exterior design is also a bit wild for some, especially older more conservative buyers which, ironically, used to serve as Lexus’s most loyal customers. The LC, whose styling was heavily inspired by 2012’s equally stunning LF-LC concept, is an attempt to appeal to those younger buyers with money to spend. But now that some have spent it on an LC, it looks like a few are willing to sell at a loss. Remember, the LCs in question are all literally brand new with low miles. It’s not a bad deal, really. But that’s assuming you’ve got the cash. However, given this rate of depreciation, we wouldn’t be surprised to see LC prices go below $50k in a few years. 2018 Lexus LC500h Test Drive Review: Should Aston Martin Be Worried? Lexus seems to have cracked the code and infiltrated the inner circle.